A progressive politics that addresses the fears of voters who have been battered by austerity, globalization, and deindustrialization is absolutely necessary. Chesterfield in the north of England is where I learned much of my politics in the 1980s and early 1990s. It was there that Tony Benn, Britain’s great radical parliamentarian, led miners and their allies in a long and arduous political revolt against British Prime Minister Margaret Thatcher and the brutal austerity schemes of another era. The Labour left in Chesterfield preached solidarity with workers in Britain and around the world, it decried racism and sexism and environmental degradation, and it was profoundly skeptical about undemocratic economic arrangements that favored bankers over working families. Members of the Chesterfield Labour Party, who gathered at Unity House on Saltergate Street, were heartbroken when Thatcher’s cruel politics prevailed. The mines closed and the miners were forgotten, as were many of the communities of northern England, by British governments that grew ever more focused on promoting the financial trades of London bankers and on grand talk of markets and globalization. The UK is different from the US. But the Brexit vote is a message about the need for an economic-justice politics. Chesterfield has changed a good deal, as communities that experience economic upheaval always do. But it is still very much a Labour town. It never sends heirs to Thatcher’s Conservative Party tradition to Parliament. Nor does it have much taste for the candidates of the crudely-nationalist UK Independence Party, which has gained traction in other corners of England. Benn’s seat is now held by a member of his Labour Party. In the UK’s 2015 general election, the vote for Labour (which is currently led by Jeremy Corbyn who, with the member of parliament for Chesterfield, advocates for economic fairness and humane internationalism) was greater than the combined vote for Prime Minister David Cameron’s Tories and the immigrant-bashing UKIP. Yet on Thursday Chesterfield cast an overwhelming “Brexit” vote, favoring Britain’s exit from the European Union. There were 34,478 votes for leaving, versus 22,946 to remain—a 60-40 margin that was echoed across the battered mining regions of northern England and beyond. There were many factors that underpinned Thursday’s narrow 52-48 UK win for the Brexit option. The Leave campaign employed xenophobic messages, playing on anti-immigrant and anti-refugee sentiments. There was also an old-school English nationalist thread that ran through the campaign. But there was, as well, an appeal to “Labour heartland” voters who were simply frustrated with the bold experiments of British and European elites that never seem to deliver for communities that have lost mining and manufacturing jobs. Chesterfield is different from Lorain, Sheffield is different from Youngstown, the United Kingdom is very different from the United States. Yet when I watched the UK count Friday morning—and the stunned reaction of the elite commentators who are always the last to know—I thought of the American cities that have been hit by globalization, outsourcing, and deindustrialization. And I thought of Donald Trump, who has directed so many of the messages of his campaign to the people who feel they have been left behind by political leaders who peddle free-trade schemes like NAFTA, most-favored-nation trading status for China, and the Trans-Pacific Partnership. 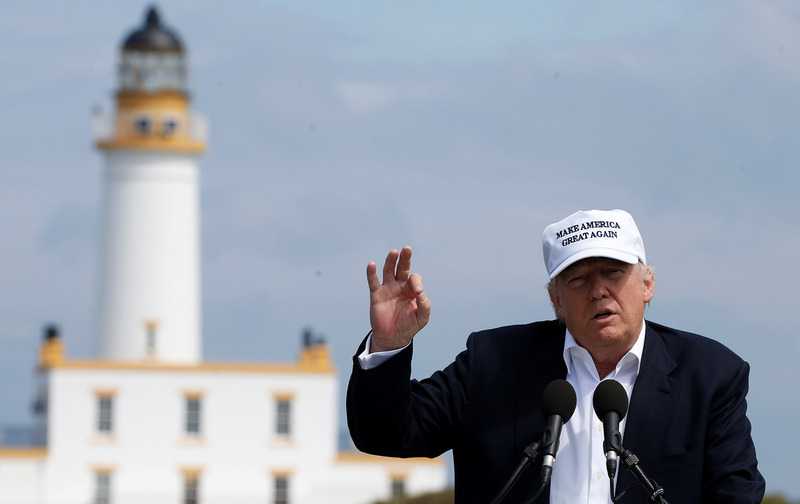 Trump may have looked like a fool to knowing observers on Friday, as he celebrated the Brexit vote in Scotland—seemingly unaware that the Scots had just voted by an overwhelming margin to remain in the EU (and may now choose to leave the UK and position itself as an independent and internationalist nation). But Trump is no fool; there are no coincidences with the most cynical presidential contender since Richard Nixon. Trump traveled to the UK with the intent not to speak to Scots, or to Brits, but to Americans—especially to Americans who live in the battleground states where presidential elections are decided. Democrats should recognize this. Those who seek to stop Trump would be foolish if they failed to see the parallels between his campaign in the US and the Leave campaign in the UK. Indeed, it is with this recognition, and a response to it, that the defeat of Trump can be assured. British political and media elites underestimated the full appeal of the Leave campaign. Americans who seek to defeat Trump and Trumpism must avoid making the same mistake. Yes, Trump bashes immigrants and refugees and practices a hateful politics that will inspire a great many Americans of varying partisanships and ideologies to oppose him. But the same was true with the worst players in the Leave campaign. Yes, Trump’s economic promises are empty—he lies every bit as cruelly as the Leave campaign did with claims that a Brexit vote would lead to instantaneous prosperity and social progress. But the Leave campaign succeeded in a very-high-turnout election; and it succeeded because it drew votes not just from haters and crude nationalists but from voters who feel frightened and beaten down and left out of a global economy that does not work for them—that has not worked for them for a long time. The US is different enough from the UK demographically, culturally, and politically that Trump and Trumpism can be defeated in November. Americans should be able to recognize that a “billionaire populist” will always be more billionaire than populist. Trump may not have much to offer frightened, beaten down, and forgotten voters, but he is speaking to them. But Democrats must recognize their vulnerabilities in battleground states that have been battered by trade policies that invariably serve Wall Street rather than Main Street. Trump’s backward-looking “Make American Great Again” program is no answer for the future. But nor is a promise to extend economic approaches that fail to address the frustration and fears of working-class Americans in battleground states such as Ohio (latest Quinnipiac poll: Trump 40, Democrat Hillary Clinton 40), Michigan (Detroit News poll: Clinton 43, Trump 39), Pennsylvania (Quinnipiac poll: Trump 41, Clinton 42), and North Carolina (PPP poll: Trump 48, Clinton 46). Brown says he is confident about Clinton’s prospects this fall, arguing that she will stand on the right side of trade and economic issues; and it is true that she has declared her opposition to the TPP and spoken of new approaches to trade and job creation. This is a start, but it must go further; Clinton and the Democratic Party must campaign this year with an economic-populist message and an economic-populist ticket that includes a vice-presidential nominee like Brown or Massachusetts Senator Elizabeth Warren or Congressman Keith Ellison. Democrats cannot merely oppose Trump. Democrats must be aggressive in their anti-austerity campaigning, recognizing that the support Bernie Sanders attained was a knowing and necessary cry for a new politics that speaks to all the voters who have been forgotten and left behind in an era of austerity. That is more than the lesson that Democratic leaders should be learning from the Sanders showing in primary and caucus states. This is an urgent message from the United Kingdom that cannot be ignored by Democrats in the United States.